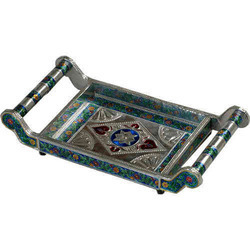 Creating a niche of Decorative Trays such as Decorative Tray, Dry Fruit Tray, Service Tray and Gift Tray at its best, with utmost quality. 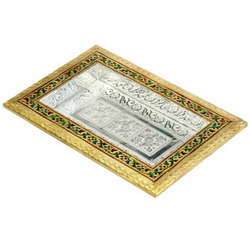 Decorative Tray offered is made available by us in different material options including Wood, Brass, Aluminum, Jewel Color (Mina). Here, we can offer these in different sizes like 08 X 08 X 02 Inch, 10 X 10 X 02 and 12 X 12 X 02 under item code of YHB 196. These can be used for serving snacks as well as main course items and besides its high decorative values, these also feature high finish durability with smooth edges and excellent finish support. 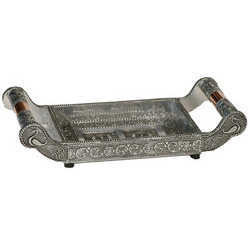 10 X 10 X 02 "
12 X 12 X 02 "
Dry Fruit Tray offered is made available by us under item code of YBM196. Here, our expertise lies in making these available in material finishes like Jewel Color Meena, Wood, Aluminum, Brass with available color options including Silver, Oxidize, Jewelry Color. Here, our expertise lies in making these available in sizes of 12 X 08 X 02 Inch, 14 X 10 X 02 Inch and 16 X 12 X 02 Inch and finds high suitability for packing of dry fruits. These feature elegant designs, finishes and polish support that enhances its overall presentation. 07 X 07 X 01,"
10 X 08 X 01, "
12 X 08 X 01, "
07 X 07 X 01, "